One of West Chester’s most unique runs is trotting our way! It’s Kildare’s of West Chester’s eighth annual Running of the Turkeys, where costumed competitors will once again carry frozen turkeys through the streets of West Chester in this one-mile fun run before donating their big bird to John DeBella’s annual Turkey Drop. Many of the runners take the best costume competition more seriously than being the fastest runner! 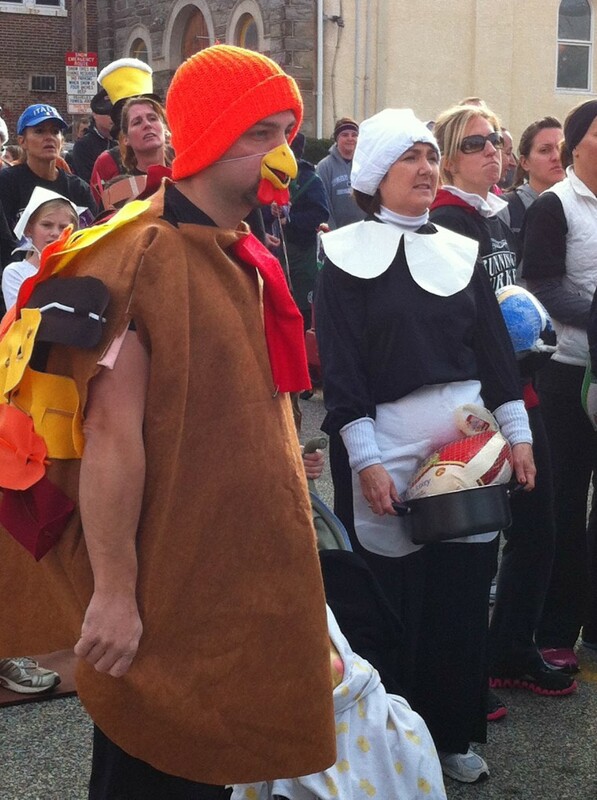 Previous participants have dressed as pilgrims, Santa Clauses and even turkeys. Runners have been known to carry their frozen bird in innovative ways, too, including in backpacks, wagons and baby strollers. So if you plan on running, be creative! It’s a sight to see, and it’s all happening on Sunday, November 19, with a great post-race party at Kildare’s. This one-mile fun run is a race that the whole family can enjoy planning and participating in as a team. Brainstorm with the kids on how to best carry the frozen turkey and get creative with your costumes. Pull out those reindeer ears or dig out that Thanksgiving play costume, dress as a chef or even a mustachioed John DeBella from 102.9 WMGK! Develop your family plan for hoisting or wheeling that turkey through the streets with pride. If you’re not sure about running this year, come on out to cheer on those who are. It’s a festive and colorful run that will have everyone grinning with joy and stir up your Thanksgiving spirit! If you’d like to run, show up to Kildare’s at 11 a.m. with your frozen turkey, which is the price of admission. For those who can’t buy a turkey in advance, a limited number of turkeys will be on sale at Kildare’s, so arrive early to secure yours. All turkeys and proceeds are donated to the annual John DeBella Turkey Drop, which will be broadcast on WMGK on the morning of November 21. Last year’s turkey drop delivered almost 10,000 turkeys to area families! Feeling particularly strong this year? You may want to race in the 100-pound division. Simply show up and carry more than 100 pounds of turkey for special recognition! Last year, five runners carried more than 100 pounds of frozen birds. Burn the calories on Sunday so you feel less guilty consuming all those calories on Thursday. 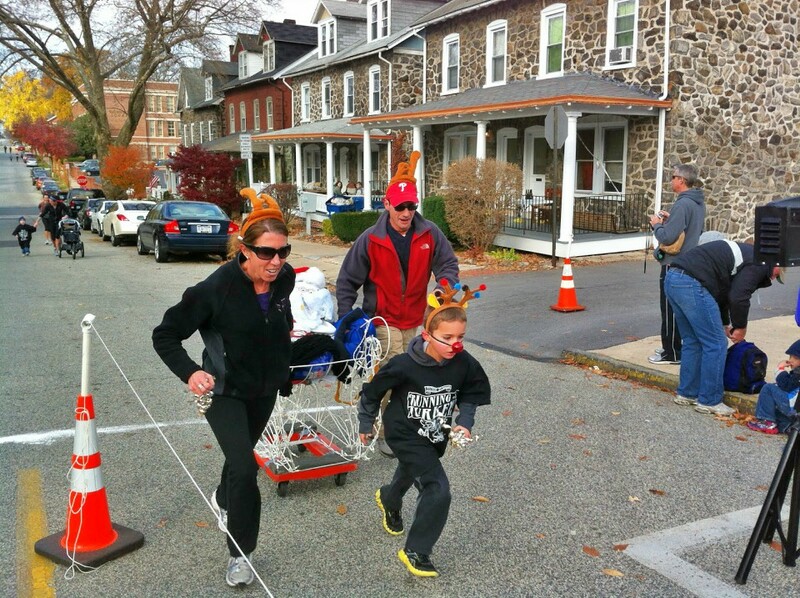 West Chester businesses have generously donated prizes that will be awarded for the following categories: Fastest Man, Fastest Woman, Fastest Boy, Fastest Girl, Most Turkeys Carried, Most Creative Carry, Best Holiday Outfit and Heaviest Turkey. Save the date and start talking up your race strategy today! We hope to see you on Sunday, November 19, at Kildare’s of West Chester. Remember, registration starts at 11 a.m. and the one-mile race takes place at noon. Good luck to all race participants!